A Pontifical is a liturgical book containing texts specifically to be used by a pope, archbishop, or bishop; it includes services for consecrations (of bishops, of churches, cemeteries, etc); and blessings (for a bell, a well, a seal, etc. ); among many others. This manuscript seems to have belonged to Exeter Cathedral in the Middle Ages, and was perhaps made there. 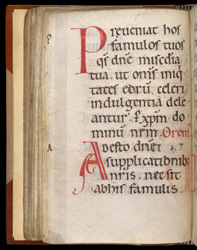 This page shows the use of simple yet sometimes elegant red enlarged initials, and the large clear script: despite being a small volume, it might be held for the bishop by an Acolyte, and therefore needed to be legible from a slight distance.